John Muldoon departs the field dejected. 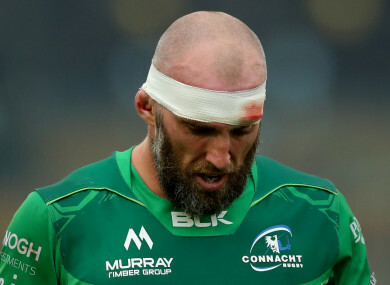 Connacht head coach Kieran Keane seemed intent on abiding by that old adage as he conducted a terse post-match press conference after a 15 – 17 home defeat to Pro14 conference rivals Cardiff Blues. “It’s a bad start to the season,” Keane admitted while hovering above the Brendan Venter-Sireli Bobo watermark for clipped answers. The third loss of the campaign reminded the Kiwi a lot of the first (12 – 18 at home to Glasgow) as Connacht stuttered their way through the first half and trailed 3 – 7 at the interval despite being backed by a strong wind that put about 20 metres on kicks. Seven first-half penalties (13 in total) punctured attempts to build momentum with ball in hand in that opening period. Yet the second half did offer up plenty of silver linings as a 30-phase move was rounded off by Darragh Leader and Shane Delahunt grounded late on to give the western province the lead for the second time in the final quarter. However, both of those leads were quickly fluttered away and Keane responded to the chance to speak about second half positives with a simple: “yeah, you’re right”. “I don’t think we had the right attitude at all. We knew it would be pretty combative against Cardiff, we planned for it, worked hard all week an various things and we were confident we were well prepared and ready to go, but we didn’t fire a shot. Connacht face the champions next week in Llanelli and their own reign feels an awful long time ago. Email “'We didn't fire a shot': Another Connacht loss leaves Keane short of words”. Feedback on “'We didn't fire a shot': Another Connacht loss leaves Keane short of words”.